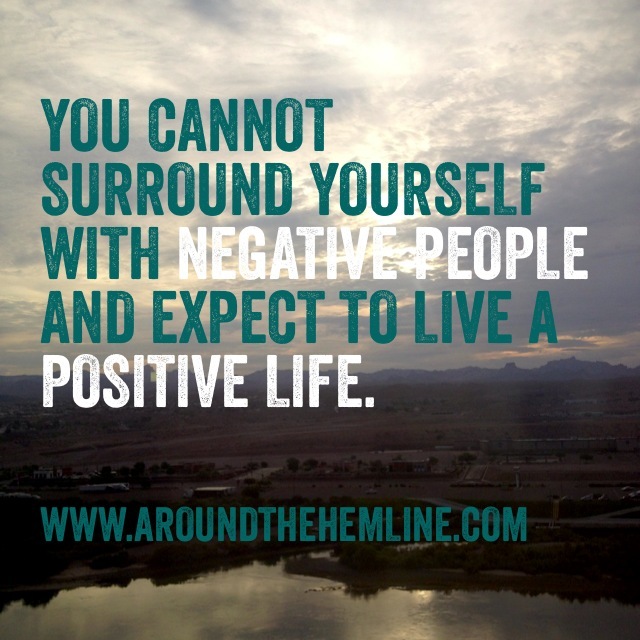 You cannot surround yourself with negative people and expect to live a positive life. Here is an example in life that opposites do not attract. A negative and a positive do not cancel the other out. A negative does not repel a negative. A positive does not repel a positive. It’s actually the opposite, negative builds on negativity. Positivity builds on positivity. Since being back home (for those new readers, I recently moved from New York back to California), I’ve been able to reflect on the environments, situations, relationships and the energy that surrounds me here and how they surrounded me in New York. Although it seems rudimentary to know this revelation, it never really dawn on me that being surround by those that complained, those that refuse to make new changes about their life/situation and those that just can’t let go of the past were just negative. I thought I was being a good friend/colleague/family by lending an ear and a shoulder to cry on but all the while, it was making me feel negative! I’m NOT saying that you leave all those negative people to fend on their own but you start to draw boundaries. Sometimes all they need is just a reality check on how negative they are becoming. There was point in my life where a truly good friend of mine gave me a reality check and said to me, “I just can’t be around you” because all I seemed to do was complain about a situation that I wasn’t going to change. I was so stubborn that I thought I was stronger by dealing/staying in my negative sitaution. Sadly, we didn’t speak for quite some time. Of course, I was offended but her action of choosing to leave a negative situation (me) but it made me realize, I wasn’t the stronger one, I was actually weaker and SHE was stronger for leaving. I didn’t want my negative situation/complaints to be cause of losing a good friendship. So I made positive changes in my life and now we encourage each other to be make positive choices for ourselves and those around us. If something – whether that be a job, a relationship or friendship – isn’t serving you a positive purpose in life, then why keep that in your life? I know that life is all about balance so we DO need some negativity in our lives just to remind us to be thankful for the positivity in we have, but we must all find a balance. Be the positive person that people surround themselves with, you never know who you can inspire or motivate.